Mark Lesko served three tours in Vietnam and now he wants to make sure veterans are given the respect and the rights they deserve. Lesko was keynote speaker for the Vietnam Veterans Day ceremony Thursday, March 29, at Ho-Chunk Gaming – Wisconsin Dells. Joseph WhiteEagle served as emcee for the event while the Wisconsin Dells Singers provided the music. 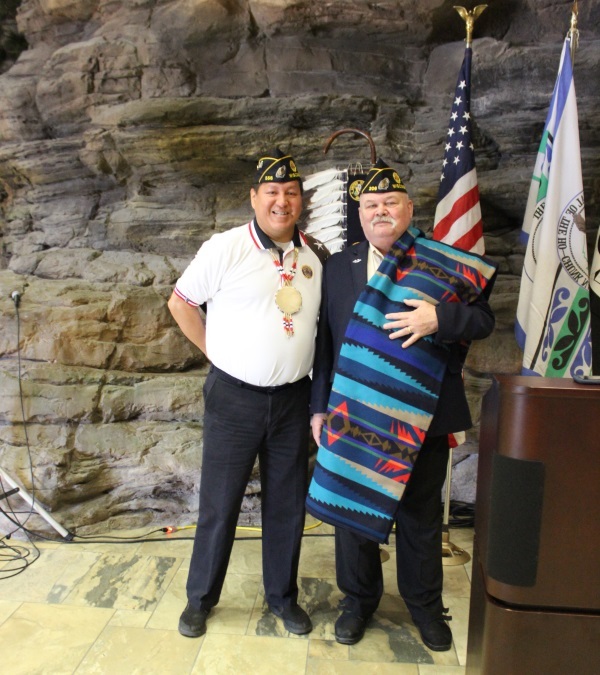 WhiteEagle gifted Lesko with a Pendleton blanket, given by the Sanford WhiteEagle American Legion Post 556 in Wisconsin Dells. All the veterans suffered from Post Traumatic Stress Disorder (PTSD) and many never got the help they needed, he said. Lesko’s journey into the armed forced began after high school. He was a football star in college, but when his grades dipped below a C, he was drafted. He was in the Airborne Infantry, and stayed in the infantry until the day he returned to the United States. Besides his duties as a soldier, he found refuge in being able to help other people. “I loved the humanitarian efforts. I worked at an orphanage in China Beach. I’ll never forget the day, Christmas Day in 1969, I was driving along with a chaplain when we heard babies crying,” he said. “We stopped the jeep and found two Amerasian babies, twins, who were abandoned in a swampy area. Amerasian babies were outcast because they were neither accepted by the Vietnamese or the Americans. We called in a helicopter, which arrived and flew the babies to a hospital to be checked out,” he said. When Lesko left Vietnam, he escorted the twins to the United States. His humanitarian effort was not forgotten. He still keeps in contact with them today. One is now a physician and the other an attorney. In 1995, Lesko went back to Vietnam with Sen. John McCain concerning a government program. Lesko has a Master’s degree in agriculture and the U.S. government was looking to promote trade with Vietnam. He went back to the same orphanage where he had volunteered his time and efforts and was shocked to find that a woman picked him out of the group and remembered him from when he served in the Army. Also, there were a couple of orphans there that had been terribly disfigured due to napalm, which was used by the Americans to defoliate the jungle canopy. The orphans also recognized him. Now, he is becoming involved in an effort to find the bodies of lost service members and bring them back to the United States. “I’m waiting to go back for a dig to find the bodies of my brothers,” he said. He came back with terrible memories of what had happened there during his service, diagnosed as PTSD. He still has night terrors and he has two blue heeler dogs who have been trained to wake him up whenever those terrors cause him to lose control. Lesko has been working on committees with the Tomah VA Hospital, doing some great things with veterans. He disputes what local newspapers have been saying about the Tomah VA Clinic. He is an advocate for the Douglas Legacy Farm near LaValle, WI. The farm is a home for rescued horses and a place for veterans to gather. Douglas Legacy Farm offers veterans free use of the farm home for meetings, the grooming of horses, and the walking of horses across pastures. It is held in trust as an equine rescue farm dedicated to assisting veterans. Life is easier when you get help, he said. “We need strong, healthy guys – guys who came back tarnished,” Lesko said.